Drinking eggnog is a Christmas tradition in many countries because of its warming effect in cold weather. It is just as delicious served chilled! Eggnog, also known as milk punch, is a rich, sweet, creamy dairy-based drink traditionally made with milk and/or cream, sugar, and eggs with the addition of brandy, rum or bourbon. It is served with a sprinkling of ground cinnamon or freshly grated nutmeg. The word “nog” is said to stem from the word “noggin”, a small, carved wooden mug that was used to serve alcohol years ago. According to food historian and Babson College professor Frederick Douglass Opie “eggnog most likely evolved from British aristocracy. While the lower class couldn’t afford fresh milk and eggs, the wealthy would at times drink their warm milk and egg beverage seasoned with pricey spices, such as ground nutmeg and cinnamon and add pricey liquors, such as brandy and sherry, to prevent spoilage“. Be sure to try my “Top-deck” Chocolate Mousse to utilize the egg whites! Add a big spoonful of the hot milk to the egg mixture, whisking vigorously. Repeat, adding a big spoonful at a time, to temper the eggs. Once all of the hot milk has been added to the eggs, pour the mixture back into the saucepan on the stove. Whisk constantly until the mixture thickens. It should coat the back of a spoon and look like thin custard. Add the cinnamon and nutmeg and mix well. 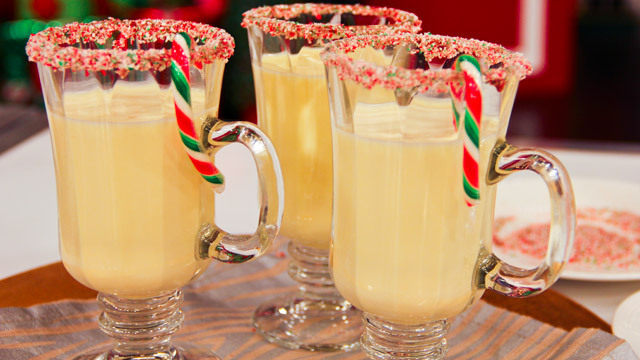 Pour the eggnog into a pitcher or individual glasses and serve immediately or set aside to cool, then refrigerate for at least 2 hours for chilled eggnog. 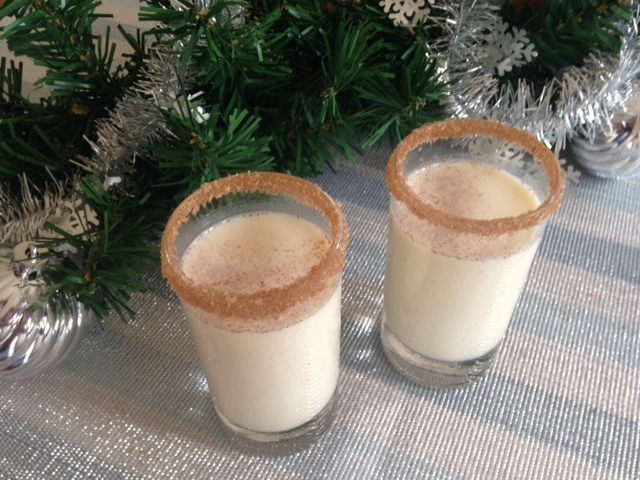 “Melktertjies”, also know as “melktert shooters” is as South African as can be and basically our version of eggnog. It smells and tastes like melktert (Milk Tart) with a bit of kick. 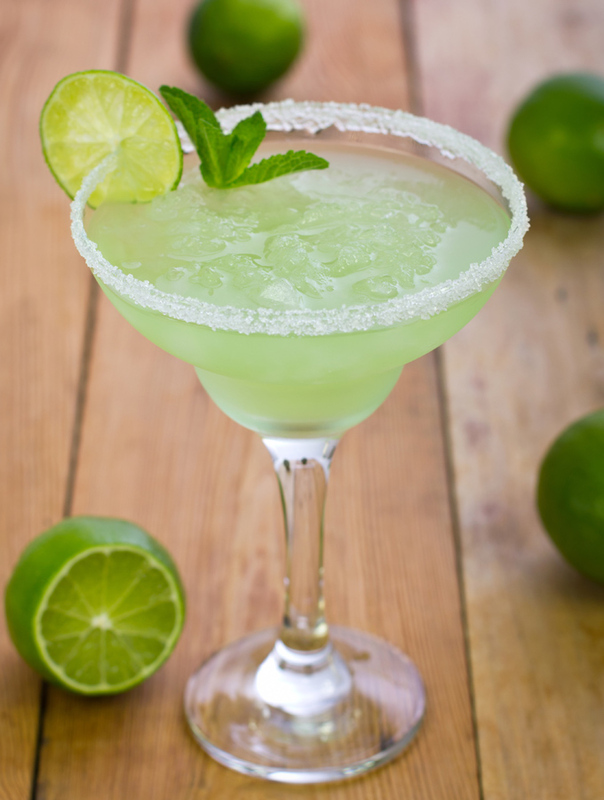 A single sip of this delicious alcoholic drink is all it will take to make you want to come back for more. Be sure to try Carolié’s authentic recipe for Grandma’s Milk Tart, which is the real deal, or her quick and easy Quick Baked Milk Tart, which is a crustless version of this South African favourite. Be sure to also try the recipe for Home-made Eggnog, which can be served hot or cold. The mixture can unfortunately not be turned into “Melktertjie” Ice-cream due to the high alcohol content, but it tastes great if you place the mixture in the freezer for an hour or two before serving. Combine the ingredients in a hand blender and process until blended. Alternatively, pour the ingredients into a shaker and shake well. When ready to serve, combine the sugar and cinnamon in a small mixing bowl and mix well. Separate the egg and transfer the egg yolk to a ziplock bag. Seal and refrigerate for later use. Dip the rims of the glasses in the egg white and then in the cinnamon-sugar mixture. Stir or shake the Melktertjie-mixture well before dividing it between about 12 shot glasses. Add more Vodka if stronger Melktertjies. Divide the mixture between 4 x 200 ml small glasses for a Don Pedro-type drink (pictured below). Substitute the Vodka for additional milk for a child-friendly version. The recipe can easily be doubled for more portions. Treat your guests with this refreshing drink on arrival! Combine all the ingredients in a container of a suitable size and transfer to jugs or pitchers. Serve chilled with ice, fresh mint leaves and lemon slices as preferred.